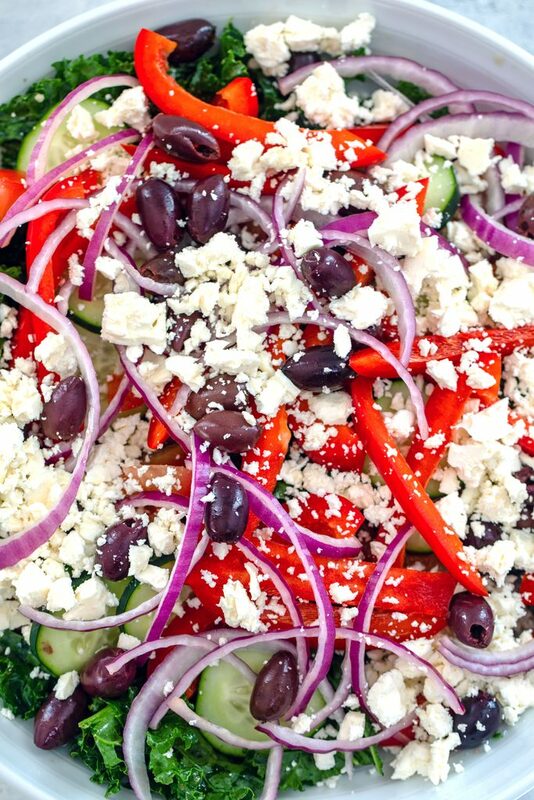 Thanks to lots of fresh vegetables, kalamata olives, and feta cheese, a Greek salads is always delicious. But a Kale Greek Salad is both delicious and extra healthy! 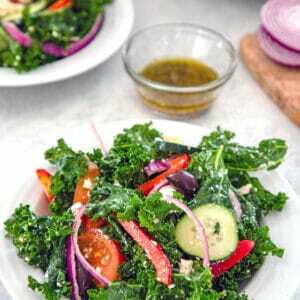 (This recipe for Kale Greek Salad was originally published in December 2011, but was updated with new photos in 2019). If we go out to lunch together, chances are you won’t see me ordering a salad. But that doesn’t necessarily mean I’m averse to ordering salads out. If a restaurant offers me a salad featuring ahi tuna, for instance, I’m generally game. Or if I’m going through one of my regular Caesar salad cravings (but let’s be honest, Caesar salads are generally pretty lacking in vegetables). Or yes, the typical Greek salad. It must be something about the combination of fresh veggies with kalamata olives and feta cheese (read: salt!) that I absolutely love. But no matter the salad, I’ve never been much for iceberg lettuce. Romaine doesn’t really do it for me either. Kale, on the other hand? Not only do I feel like some sort of healthy rockstar when I eat kale, but I also find it to be so much more flavorful than all that other watery, bland stuff. 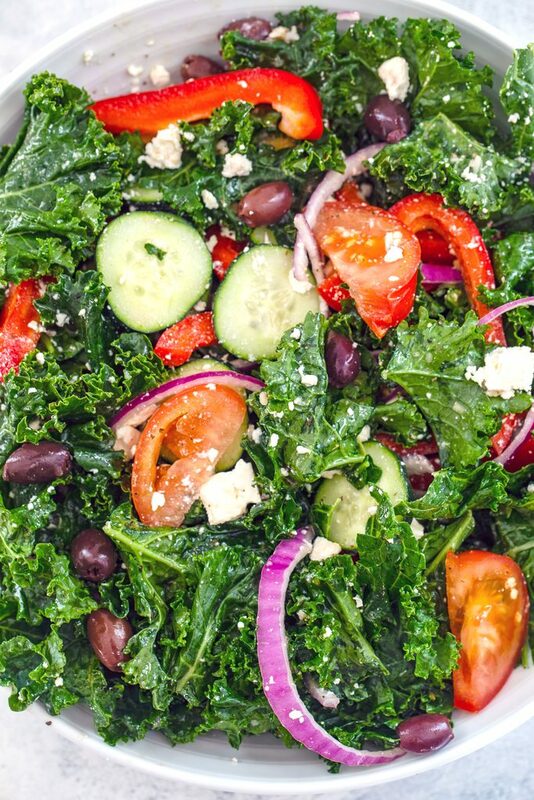 In continuing with my let’s add more vegetables to my diet as soon as possible mantra, I whipped up this quick Kale Greek Salad. I think I get extra points for healthifying it up with kale. But who’s keeping score? Just me? OK.
Let’s not pretend I invented the wheel, here. I’m not that smart. Everyone knows how to make a salad and everyone has preferences for what they like in a salad. I used the typical Greek salad veggies, but feel free to subtract any out or add any in. I did use kale in place of lettuce after all. For me, this is the most perfect Greek salad and if I love it this much, I hope you will, too! All you really have to do is clean and chop your kale (making sure to remove the tough ribs) and slice the rest of your veggies. Oh, and crumble that feta, too! Before you add everything to a big bowl, make your dressing. This part is important! Again, this one is a pretty basic with a couple little tweaks. I love a garlic-y salad dressing, so I used not only minced garlic, but some garlic powder, too. The lemon adds a nice touch of brightness and the dijon and red wine vinegar a little bite. Whisk all the ingredients together in a bowl or whatever kind of container you like to make your dressing in. Why Should I Massage Kale? Now, put the kale in a big bowl and pour about 4 Tbsp dressing over it. Using your (clean) hands, gently massage the dressing into the kale. You don’t have to go crazy, but just spend a minute or two massaging it (believe it or not, massaging kale is kind of therapeutic). When you eat kale raw, it can be a little bit tough and massaging it helps break down the cell structure and soften it a bit. If you haven’t enjoyed kale salads in the past, try massaging the kale and see if that makes a difference for you! Don’t massage it too much, though, or the kale may start to get soggy! Once your kale is sufficiently massaged (take a bite to see how you like the consistency!) add your veggies, olives, and cheese on top. Add some more of the salad dressing and toss! Serve on individual plates or bowls and add more dressing if you desire. If you’re a bit nervous about eating raw kale in a salad, don’t be!! The flavor of the kale isn’t over-powering in this kale Greek salad and thanks to that nice luxurious massage, it isn’t too chewy either. But the best part? 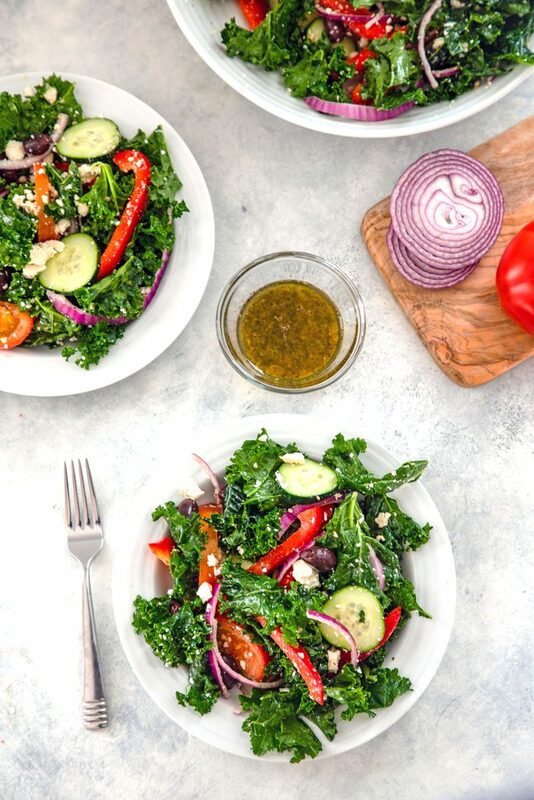 Make your Greek salad with kale means your Greek salad has even more flavor thanks to the yummy bite the kale brings! Guys, I have officially converted Chris into being a no complaints made kale eater. You have no idea how proud of myself I am. Maybe he wouldn’t order a Greek salad with kale when we’re out at a restaurant, but he happily eats them at home. And he also happily drinks all the green smoothies with kale that I serve to him. If this kale Greek salad salad was always in my fridge, I think I’d happily eat it for lunch every day. And if I wanted a sandwich, I’d put it in a pita and call it a lunch! As it is, this recipe made a pretty big salad, so I enjoyed it for quite a few days. Now, if only I had someone to run to the grocery store and chop all these vegetables for me every week. Hmmm. (oh and while they’re at it, they should probably hide the cookies and candy from me, too). Let’s just say that so far, I’m pretty happy about adding these extra vegetables into my life. Let’s hope I can carry it into the New Year! But first, I think I’m going to enjoy my weekend quite a bit. Maybe even sans kale. You? Are you a salad person? Do you ever eat your salads with kale? If you like this Greek salad with kale, be sure to check out my Greek Nachos with Lamb or my Greek Skillet Lasagna. 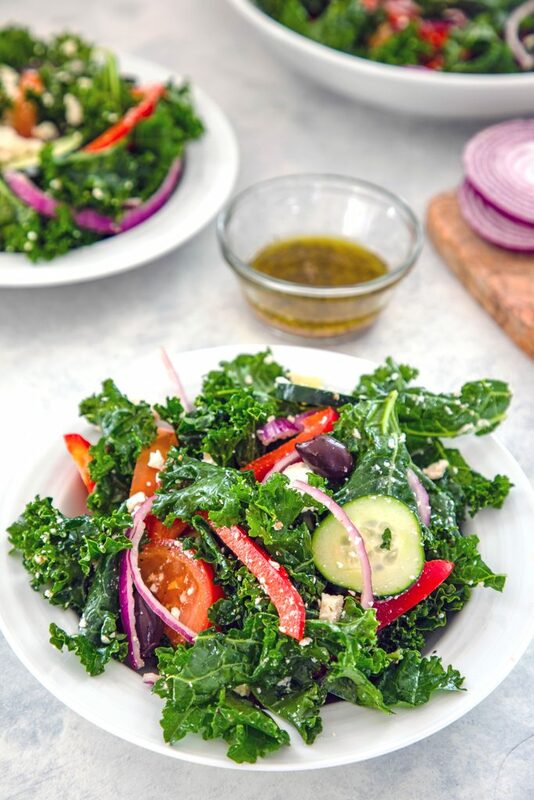 If you’re looking for more kale salad recipes, check out this delicious Kale Berry Salad from Kudos Kitchen by Renee! Place kale in a large bowl and drizzle about 4 Tbsp of Greek dressing over it. Using your (clean) hands, gently massage kale for 1-2 minutes, until kale is softened but not soggy. Add tomatoes, cucumber, red pepper, onion, olives, and feta cheese to the kale, along with more of the dressing. Toss to combine. Serve salad on individual plates or in individual bowls with additional dressing on the side. 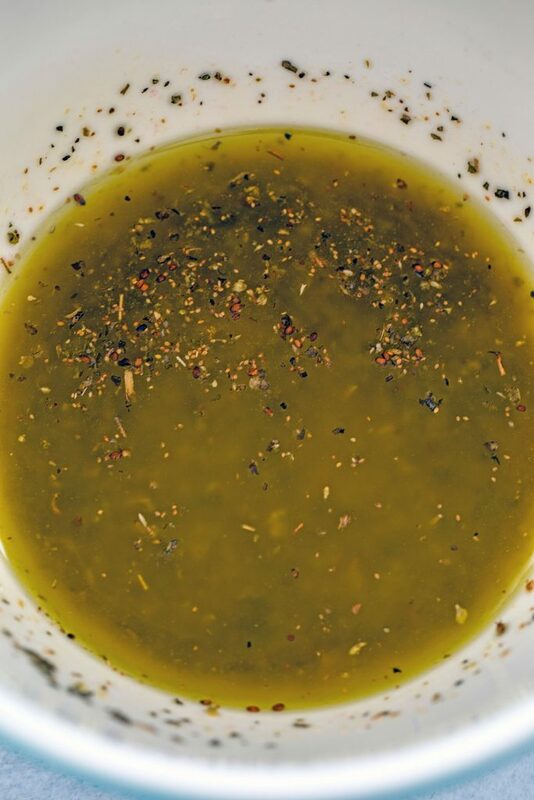 Add all ingredients in a small bowl or salad dressing container and whisk together to combine. Keep dressing in airtight container in the fridge until ready to use. 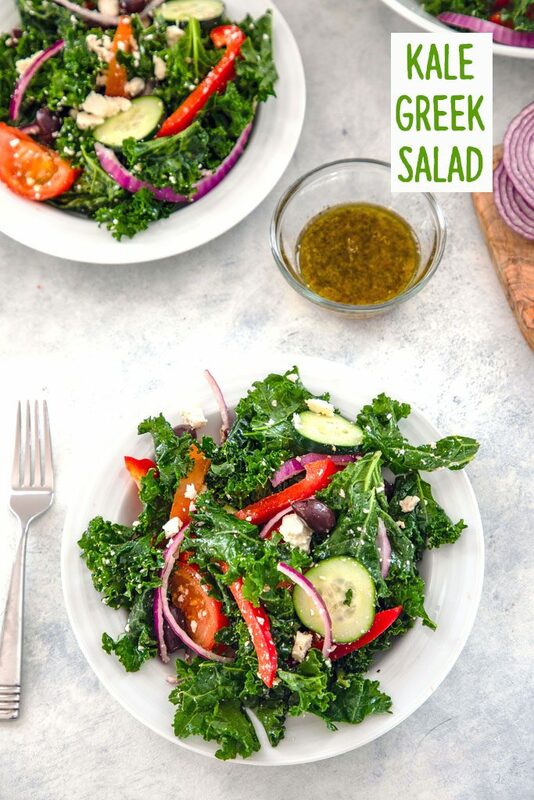 8 Responses to "Kale Greek Salad"
Greek salads are one of my favorite way to eat veggies- this looks fabulous! This is an amazing idea!! I love cooked kale and who can say no to those Greek salad toppings? The combo sounds like a perfect way to get your veggies! Great idea! Makes me want to rush out and buy kale ASAP! The only way to make a Greek salad even better! Now I’m craving one. The dressing recipe is great!